During wind events, trampolines always seem to be the first to go. Sheila Hipp took this photo off Missile Rd. in Wichita Falls. Kimberly Speegle took this photo off Missile Rd. too. 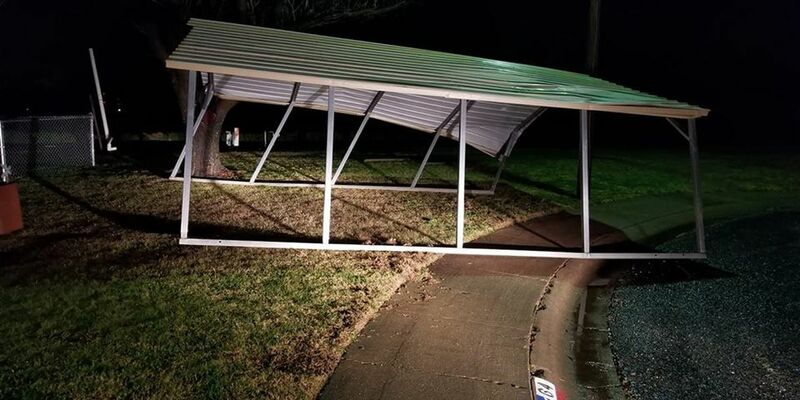 Christopher Ruggles sent us these photos of a carport blown around and car damage from City View. 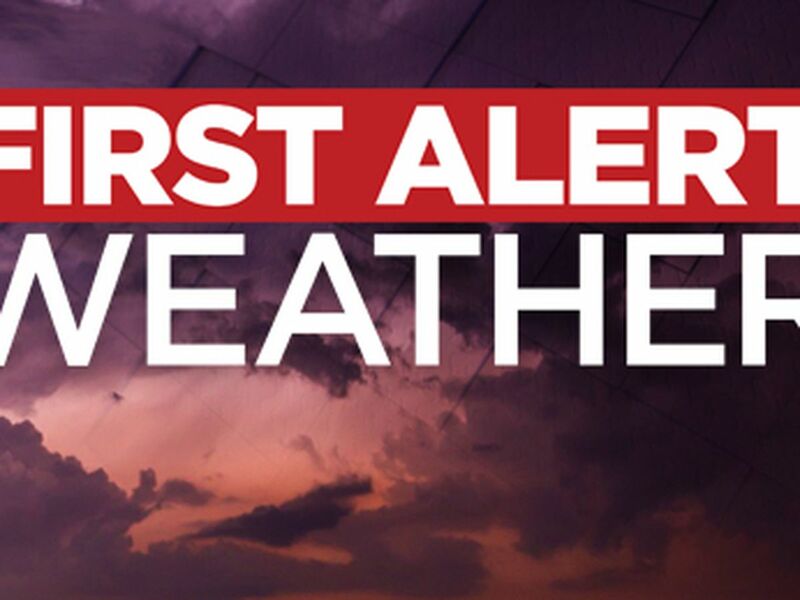 There were wind damage reports from Graham up to Lawton and everywhere in between. So what caused all this damage? Last night we saw a squall line. This is an explanation from the National Weather Service. A squall line is a line of thunderstorms. They usually form along a lifting mechanism. Last night, that was a cold front. If you look at the photo above air flows into the storm and out of the storm. This air is moving in opposite directions. The downdraft is where the rain is. This is usually where we see very strong wind gusts flow out of the storm. The inflow can produce strong winds as well. As far as last night goes we can look at these radar images of velocity of Wichita Falls. The green color means wind is flowing toward the radar. Which is located in Frederick, Oklahoma. The red color means the wind is flowing away from the radar. Here we saw SE winds ahead of the line of thunderstorms that resulted in 58 mph radar estimated wind speeds. As the line of thunderstorms passed we saw westerly winds. There was a shift in wind direction before, during and after the storm which was recorded at Sheppard Air Force Base. Over a quick span of about 15 minutes we saw SE winds. A strong SW wind gust of 64 mph and a strong W wind gust at 64 mph. This is why debris was blown in different directions. Wind is not consistent throughout the line of storms. This line was made up of several storms. You do see the strongest winds where the radar bows out like over the city of Wichita Falls. Here is a look at the top wind speeds recorded. 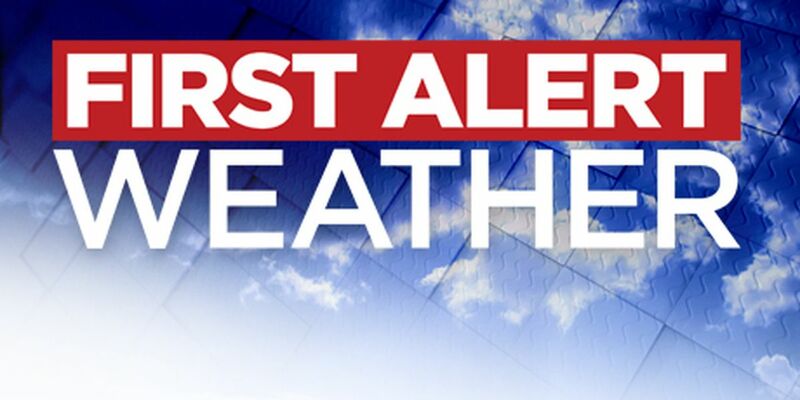 The National Weather Service does believe we saw 80 mph wind gusts at times due to the damage we saw. It is important to note that an EF-0 Tornado is 65-85 mph winds. EF-0 tornadoes can occur in Squall Lines. However we did not see tight enough couplets on radar to confirm there was a tornado. This was a strong straight line wind event. The line between the outbound and inbound wind is fairly pronounced. If we saw a tornado the radar would look more like this event in East Texas from the National Weather Service. 65-85 mph winds will cause damage like we saw across Texoma without it being a tornado.